Hi Sarah, tell us something about you by way of introduction. How long have you worked for yourself? 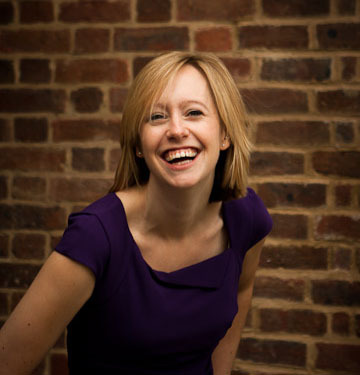 I’m Sarah Lloyd-Hughes and I’ve been running Ginger Coaching & Training for just slightly longer than four years now and during that time I’ve also published the book How To Be Brilliant at Public Speaking. Now tell us about your business. What’s it all about, how do you think and feel about it now? I suppose my journey started off many years ago. I’ve never really been the sort of person who’s felt comfortable or done very well having a boss and I’ve been through various big businesses and an antique consultancy in India and gradually getting into smaller and smaller businesses until I had the confidence to start up for myself. It didn’t feel like something I should be doing as a person, I never saw myself as an entrepreneur, but as soon as I started I saw that there was not really any other way that I could live and now being no longer employable, as I describe myself, I found this way of living very fulfilling. But it wasn’t always easy. I remember the very first day when I sat down with a blank piece of paper and it was my day (I was working or someone else part time to keep the bills paid) and I was almost in tears realising that I could do anything which is both empowering and terrifying at the same time. I had trained to be a life coach with CTI and had a broad idea to be a coach, I like people and I wanted to help them in some way. I had a management degree but I didn’t know how to market, select my products or get clients so the first few months were very hairy but also very idealistic. I started doing some coaching, careers, public speaking, anything – I would coach you and your dog and your vase of water too if you wanted me to, non-specific and non niche. I found that I was struggling month to month to put money together without an action plan. At some point in the first year I started thinking of writing a book, not the one I ended up writing, but it got me thinking about the book-writing process. I’d also written a little eBook about public speaking and was doing a few bits and pieces around public speaking training and was enjoying it but didn’t feel necessarily like it was my life’s calling because it felt like a skill. LinkedIn connected me to an agent I vaguely knew and got in touch with me about my eBook. He had a major UK publisher, Pearson, who had an author drop out of a project and would I be interested in stepping into the breach. I thought I would write the book and get on the ladder of being a published author but the more I delved into it the subject matter, the richer I realised it was and that public speaking is about changing people’s lives. I have a very strong niche which is all about helping people to become inspiring speakers. I help them to understand themselves more as leaders; I see public speaking as an act of leadership. I uncovered six qualities of inspiring speakers which I now train over 6 months. I flung myself at it and what came out afterwards was gold dust. From there I thought I should design a program around the book. I’ve run it 5 times two years later since publication of the book and each time it’s sold out. I am now creating the Ginger family of people who are inspiring speakers and who inspire because they are themselves, not copying someone else. One of my key learnings as a small business owner has been around finding a niche for my work. I have the ability to coach but that’s not a reason for anyone to get in touch. Many people Google that they want public speaker training because they are nervous and it’s something they fear more than anything, so I’ve set up my business around their need. The second thing I managed to do was to find an angle, a unique approach to my work, which contrasts to what everyone else is doing in public speaker training. I don’t do it like everyone else, what to do with your hands, your eyes, your body language and key phrases to manipulate your audience into buying more stuff. That approach made me feel more nervous not more natural so I know that it’s not always rules that we want. As people are more themselves and learn to communicate in an authentic and natural way, that’s when they have the power to move and inspire an audience. I developed a method which is distinct from anyone else. I look back on those 4 years and realise I’ve already managed to build something quite exciting in a relatively short period of time and now I have clients who are passionate about the work I do and share it. The first 1.5 years were a real struggle and the first 3 years I felt like I wasn’t quite “there”, a bit like pushing a heavy object up a mountain. And I was wondering when it was going to start getting easier. If I stopped would anyone notice? It was only at the tipping point of 3 years, which most don’t survive, that I re-strategised and became more focused on sales rather than creativity. I’m not where I want to be yet in terms of gazillions, and I do want to stretch things, but at this point I am doing very well and have capacity to expand. Ginger is now we, not just me, which has come in the past year when I have brought others into my business. It’s been lonely and I appreciate the company of working with others. I find that reassuring; working alongside others you can motivate yourself. I have had to learn how to collaborate but now that I have graduates I’ve realised how wonderful it is to bring them in to help train others and get feedback and create the Ginger family, who are all passionate and can continue to spread the purposes and the word to new people. I think I chose it, but I was working for a small business at the time and that didn’t really work out with them so it was redundancy from a start-up that didn’t survive the financial crisis that finally pushed me towards doing it. I had been wanting to start my own thing anyway, but it is amazing we don’t do it unless pushed. If things are too stable and comfortable, we take fewer risks. Working for yourself as a freelancer or being a small business owner is not the same as having a steady monthly salary and it can feel quite terrifying to look at your bank balance and worry about paying the bills. I have absolutely no regrets about giving up the employed lifestyle because it’s much more flexible being my own boss, I get to create, I can travel and work from different parts of the world and take a day off when I choose. In a week or two I am going to go and work from a beautiful old farmhouse somewhere in Germany, surrounded by snow and next to a lake, for a week and I can do that because I work for myself. I can choose who I want to work with, when and for how long. Most importantly it is the creative expression which is well worth the inevitable salary sacrifice at the beginning. Something which really helped me was taking a small business loan which stopped me worrying about money and so I could start thinking strategically and making a business plan to build it long term and that made me relax and forget about the next month or two and instead make a plan which was a year ahead, how much do I need and want to earn, basic minimum -v- stretch targets. What needs to happen in each quarter, how much do I need to sell and what do I need to do to get to those targets quickly and easily. I had to come to terms with being a sales person. I always though sales was a dirty word. A sales person must be a bit sleazy, to ask someone to pay you for your service wasn’t very noble, surely you should give it away? I want people to benefit from my work and reminded myself that so long as they are not buying my products, they cannot benefit from the cool stuff I have to offer them. I believe in what we do and if I didn’t encourage people to come along, I wasn’t championing or believing in their abilities but being selfish and scared. I turned away from myself, my selfishness and fear, towards my potential clients, I could convince myself they deserve to have access to this work which is about their benefit, not mine. My key revelations were around going from fear to doing it with sales, critical to business owners, especially women. We don’t want to ask too much money, put up our prices, and I just did it gradually, starting off charging whatever I felt comfortable with and giving myself a pay rise whenever I liked. Now I charge a fair chunk of money and we should look not at ourselves, but rather the importance that someone places on their own learning journey. If a senior executive is asking for your time and you undercharge, they won’t take you or their learning seriously. I encourage people to stretch. Better to have 5 clients at £40 per hour than none at £80 per hour perhaps, but as you get confident and get clients it just feels freer to charge your worth. Even from the beginning, if you know that your worth is £80, you might choose to discount it for a testimonial or to get clients to become your champions. A business that you run for yourself has huge amounts of capacity to inspire you and also others. When people allow their voice out through their business or, in my case, through their public speaking, they bring something to the world which is deeply beneficial to others. It’s not about you. It’s about the someone else you are serving. If you are feeling lazy or shy or embarrassed about getting out there, remind yourself of the benefit you have to offer and that you aren’t doing while you are sitting on your bum surfing the internet and waiting for the phone to ring; tough love perhaps? Focus on others, not you, and you become a more powerful business person. How can readers find out more about your work, and become your fans and followers?